News Express is the nearest newsagent and convenience store. Situated at this side of the Grassmarket not far from the foot of the Vennel, it stocks newspapers, cigarettes, milk and other essential foodstuffs, including some fresh fruit and veg. It is open from 7.00 to 23.00. 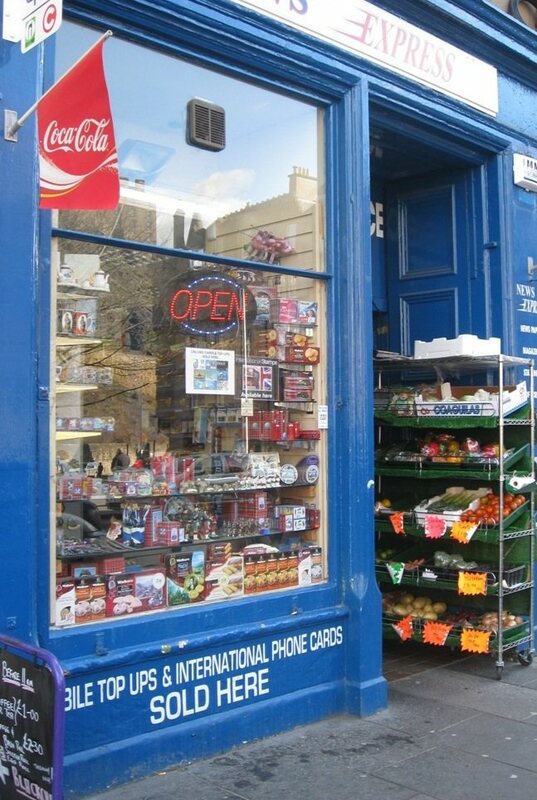 Festival Stores, on the north side of the Grassmarket near the far end, has a wider range of foods. Central Superstore is at the very end of the Grassmarket, on this side of the road, at Cowgatehead. Its stock is similar in range to Festival Stores. The Bothy Deli, on this side of the Grassmarket just beyond the Apex International Hotel, has a somewhat misleading name: it is a sandwich bar. Iain Mellis, Victoria Street, has beautiful British and European artisan cheeses - and unusual varieties of British apples to go with them, in season. Preacher's Pâtisserie, Lady Lawson Street, sells scrumptious home-baked scones and cakes, as well as very good filled rolls. Next door to Preacher's is Green Organics, which specialises in organic vegetarian ethical rawfoods. The nearest small supermarket is Sainsbury's Local in the West Port, with another Sainsbury's Local almost as close in the opposite direction, at Simpson Loan, half-way down Middle Meadow Walk. Use the pathway through Quartermile to get there more quickly. Peter's Yard, also at Simpson Loan, is a Swedish-style bakery and coffee house which sells bread and cakes baked on the premises, as well as specialty coffees and teas, Valrhona chocolate, and lots of other very tempting goodies. There are many more food shops at Tollcross. See Map. This shopping area is within easy walking distance, but it is possible to take the bus from Lauriston Place (Nos. 23, 27 and 45) . Real Foods – organic and alternative foods, Brougham Place. Nicolson Street is another local shopping area , on the No. 2 bus route, where there is a Lidl Store, and a Tesco Metro. For fresh fish, Eddie’s Seafood Market at Roseneath Street across the Meadows is excellent. Edinburgh Farmers’ Market is held every Saturday morning, all the year round, at Castle Terrace, which is a couple of minutes’ walk away. The Cash Machine at Dance-Base on the north side of the Grassmarket is free. The one next to the Apex International charges.